A decorated Bosnian Muslim commander who headed the defence of Srebrenica against Bosnian Serb forces has appeared before the war crimes tribunal in The Hague. 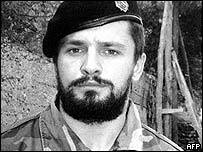 Naser Oric is accused of murdering and torturing Bosnian Serbs in the years before the infamous massacre of thousands of Muslim men and boys by Serb forces in 1995. In his first appearance on Tuesday, the 36-year-old denied six charges including murder, cruel treatment and wanton destruction of cities, towns or villages between 1992 and 1993. According to the indictment, police under Mr Oric's command beat Serb detainees and used pliers to pull out their teeth. Some were beaten to death or until they lost consciousness. Others suffered humiliation and were forced to drink urine. Mr Oric is also accused of being responsible for the burning of dozens of Serb villages around Srebrenica. "In some instances, prisoners were beaten to death. Physical abuse included beatings by various objects including wooden sticks, wooden poles, steel pipes, metal bars, baseball bats, rifle butts, bare fists, kicking with boots and forced teeth extractions with rusty pliers," the indictment says. As each charge was put to him, Mr Oric said: "Your honours... I am not guilty." Mr Oric, seen by many Muslims as a war hero for his defence of Srebrenica, was snatched last week by Nato-led peacekeepers in the town of Tuzla, and taken to The Hague. Mr Oric was once a police bodyguard to former Yugoslav leader Slobodan Milosevic in the communist era. The Bosnian war turned them into bitter rivals. Mr Oric's detention angered some Bosnian Muslims, who pointed out that key Srebrenica massacre suspects Ratko Mladic and Radovan Karadzic remain at large. However, the arrest of a leading Bosnian Muslim suspect will help counter Bosnian Serb charges that the tribunal is biased against them, pursuing only relatively few non-Serbs.